Keep Your Inner Zombie Hydrated! Smart zombies keep hydrated by carrying one of these coated aluminum water bottles with them as they roam the earth in search of human brains. 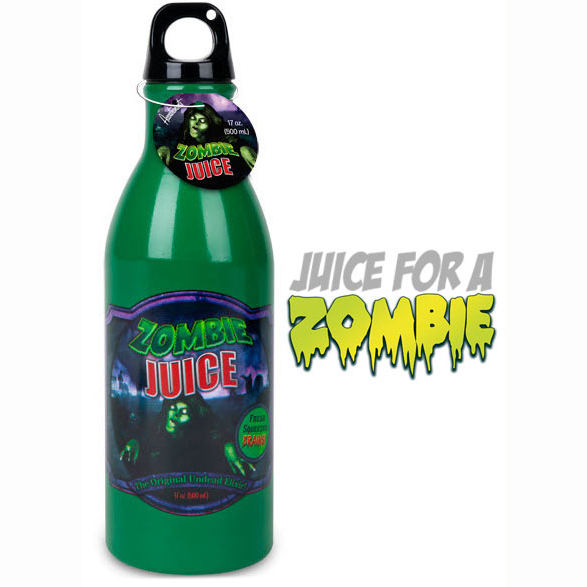 Each empty bottle features a fake label for Zombie Juice, a delicious beverage made from "Fresh Squeezed Brains!" Holds 17 oz. and is 8-3/4" (22.2 cm) tall with a 2.5" (6.3 cm) diameter on the bottom.